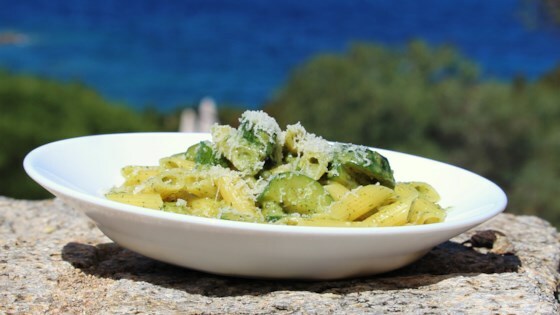 "A quick and tasty pasta dish made using homemade courgette pesto. Great for a light summer dinner." Place a steamer insert into a saucepan and fill with water to just below the bottom of the steamer. Bring water to a boil. Add zucchini, cover, and steam until tender, 7 to 8 minutes. Drain. Place basil leaves, pine nuts, and garlic in a food processor; pulse briefly until ground together. Add zucchini, 2 1/2 tablespoons olive oil, 2 tablespoons Parmesan cheese, lemon juice, salt, and pepper; pulse until combined. Pour in remaining 2 1/2 tablespoons olive oil through the feed tube and pulse until pesto is smooth. Bring a large pot of lightly salted water to a boil. Cook gnocchetti in the boiling water, stirring occasionally, until tender yet firm to the bite, about 9 minutes. Drain, reserving a few tablespoons of cooking water. Toss gnocchetti with zucchini pesto in a bowl. Thin with reserved cooking water. Garnish each serving with 1 teaspoon Parmesan cheese. Gnocchetti are small pasta made from durum flour, not to be confused with gnocchi dumplings made with potato. Substitute another small pasta shape if you cannot find gnocchetti.